Wearing a sleek and sophisticated ring with a precious stone is the perfect way to put your commitment to your significant other on display for the world to see. Some men wear rings to celebrate their engagement, while others wait until the wedding to slip a band on their finger. Either way, nothing symbolizes love and devotion quite like the timelessness of a ring accented with precious stones. A 1/2 carat Princess solitaire diamond is channel set on the heel of a four-sided band. The strength of Achilles is broken up by a dramatic groove stemming from the brilliant center stone. Mangagement™ by Brilliance. Five diamonds with a 1/6 carat total weight are inset eternity style around this 5 mm domed band in a sterling silver and 14k palladium/white gold Mokume-gane pattern. Proudly made in the USA and comfort fit. Daedalus is a symbol of hard work and strength, just like the commitment of one person to another. A nuts and bolts design spans across the finger, holding the 1 carat center diamond, prong set on a cog-inspired design. Mangagement™ by Brilliance. Design by Dehlia Sprague. This yellow gold band encases a sandy-colored inlay of ash wood and a central diamond. Koa Collection. Proudly made in the USA, this argentium silver Men's band is 7 millimeters wide and features nine round cut black diamonds that are pave set in a satin finished center. Comfort-Fit and approximately 1/5 carat total weight. Hyperion gazes into a lover's soul with a 3/4 carat solitaire in a raised channel setting. A ring of wise and understanding compassion for a dedicated partner. Mangagement™ by Brilliance. This 5 mm flat zirconium band features a Realtree pattern camouflage inlay with a single inset accent diamond and high polish finish. Proudly made in the USA and comfort fit. Grooved cuts divide this satin 8 mm cobalt band with inset princess blue sapphires and white diamonds. Proudly made in the USA and comfort fit. One princess diamond of 1/10 carat is inset into this 14k rose gold 9 mm flat band with genuine Gideon Meteorite inlay and grooved edges for a unique look. Proudly made in the USA and comfort fit. This sandblasted, 8 mm, 18k yellow gold band features an offset 5 mm genuine Gibeon Meteorite inlay studded with seven black diamonds for 1/3 carat total weight. Proudly made in the USA and comfort fit. Who said men have to settle for a plain, traditional white or yellow gold wedding band? Women aren’t the only ones who get to wear beautifully designed rings with precious stones. These days, the options are endless when it comes to men’s precious stone engagement and wedding rings. With unique settings, a wide variety of metals, sparkling precious stones, and intricate detailing, these rings are anything but average and boring. 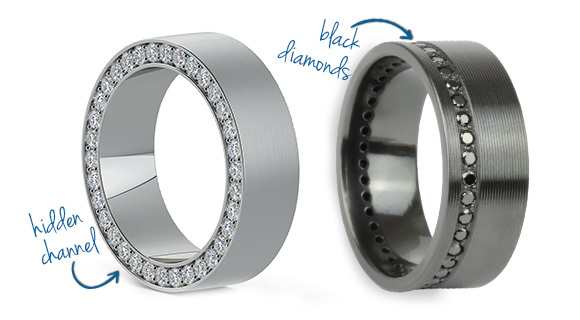 Men should choose a unique engagement or wedding ring that speaks to their personal style. This way, men can express themselves while also honoring their lifelong commitment to their significant other!